Dana, one of our in-house lab technicians, is trained at the Masters level in ceramics. Our staff is devoted to providing our patients with quality care in every way. Dr. Fitzgerald has been practicing with an In-House dental lab since 1985. It is our office’s ongoing commitment to meet our patients expectations. Most people know that having a new crown or a full mouth of new teeth that looks and feels natural does not always happen in the day to day dental experience. Dr. Fitzgerald knew that in order to do this, we would need an in-house dental laboratory, which is rarely found in a dental office. By providing this service to our patients, we can streamline their experiences while working with you to get the smile you expect. The majority of dental offices send out their work to be done by technicians you will never see. We have four laboratory technicians. One or more of them will meet face-to-face with you during process. The technicians can then work more accurately with the symmetry of the individual’s teeth and better customize each tooth. In turn, it also allows the you to ask questions and make specific requests directly to Dr. Fitzgerald and the technician. Here at Forte Implant Center we pride ourselves in making available to you the best in technology. 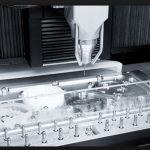 While some things are still done by hand, much is changing with the advent of dental milling machines. The leader is ZirkonZahn and we are fortunate to have one of the few M4 milling units in the country. It is a German engineered machine made in Italy. Its’ main application is in dental implant prosthetics where an entire arch of Zirconia teeth can be made at one time. Zirconia crown, bridges, veneers and abutments can be made as well. Ask for a tour when you are in the office. With an in-house laboratory, the technicians meet the patients and report to our doctor, establishing a natural sense of accountability. Having the laboratory on-site also allows for corrections of color and contour prior to your teeth being permanently placed in your mouth. No need to send things back to an outside lab or for you to travel. You have the final say on what goes into your mouth. Your happiness is our priority, and our doctor can oversee every step of the process. When the laboratory work is out-sourced, patients may have to wait longer for their prostheses rarely getting the same attention to detail. 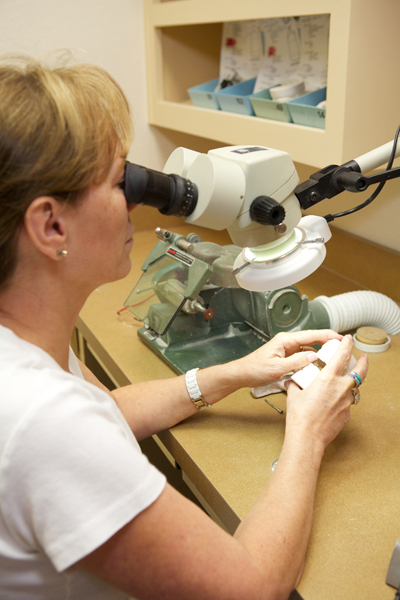 Unlike many labs, all of our laboratory technicians utilize microscopes for all work. 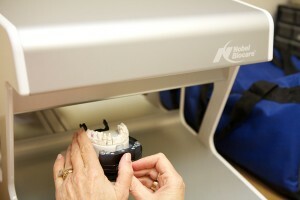 Precision is important when working with implants or anything fitting over the teeth. Imprecise measurements and loose-fitting, rough margins can lead to increased decay, periodontal disease, bone loss and other issues. We highly value excellence in every part of the dental laboratory process, and having an on-site lab allows us to closely monitor the work that we provide each patient. Dana is a Certified Dental Technician. She is our senior technician and has been with our office since 1990. Having owned her own lab for many years, Dana found it the most rewarding to work in a private laboratory setting like ours. She focuses her talents in dental ceramics and is a master at what she does. She has trained extensively with some of the world’s greatest ceramists such as Willie Geller, Michel Magne, Dr. Bob Winter, Pincus Adar and Claude Sieber. Kris came to our office in 2002 after having worked in both commercial and private labs. She also prefers the in-house environment, working closely with Dana and our doctor on every smile we create. Kris has her niche in molding and shaping your teeth. She is also our digital expert in scanning and designing the abutments we use over the dental implants placed in the office. Mario is both a Certified Dental Assistant but also a self taught Certified Dental Technician. He has been in our office since 2007. Once you meet him you will know he brings a lot to your care. He is the lead surgical and head assistant. In addition, his focus is in the implant prosthetics. He assists the doctor in implant planning and placement. Mario then transitions you into immediate teeth when doing the all on four procedure. He is the main technician who makes the removable and all implant retained teeth in our office and is an expert in the digital work flow. Robin is our most recent addition. She is a Certified Dental Assistant and has been with our office since 2016. Before our office she was one of the original prosthetic assistants at Clear Choice in Dallas. She brings years of experience in dental prosthetics to our office.